Twenty five years ago today, the United States launched Operation Desert Shield. The purpose of the operation was audaciously simple: defend Saudi Arabia from an Iraqi invasion. On August 2nd, 1990, Iraq invaded and quickly overran Kuwait. The speed of the Iraqi offensive alarmed Saudi Arabia and the other Gulf States, as well as Washington. Almost overnight, Kuwait was occupied and a large Iraqi force sat on the conquered nation’s southern border with Saudi Arabia. All that stood between the Iraqi army and oil fields of Saudi Arabia was the poorly trained Saudi army. It would not last long in a fight if the Iraqis came south. The notion of Iraq controlling Kuwait and Saudi Arabia’s vast oil reserves was unacceptable to the US. Offers of assistance were made to the nervous Saudis, and after a lightning round of negotiations in Riyadh, King Fahd opened the doors of the Kingdom to US military forces. Beginning almost immediately after the meeting, the United States started moving forces to Saudi Arabia and neighboring countries. The first US combat units arrived in Saudi Arabia within 24 hours of the orders being issued. The first wave consisted of elements of the 2nd Brigade/82nd Airborne Division, and the 1st Tactical Fighter Wing from Langley AFB. A small force that would not be able to do much to stop a determined Iraqi drive on the oil fields and eastern ports of Saudi Arabia. A lot of help was coming behind this initial force, though. As the weeks progressed, large numbers of US and allied troops, aircraft and warships converged on the Middle East. It was the fastest and deployment in US history. Within two months, the US had deployed a force large and powerful enough to ensure a successful defense of Saudi Arabia. By mid-October, the strategic goal of the US was moving from defending Saudi Arabia to the potential liberation of Kuwait. Yet the force that had been built up was not going be enough to retake Kuwait by itself. More combat power would be needed for the offensive option to be credible. The US moved to double the combat power it had available in the region. By January, two US Army corps, two thirds of the Marine Corps, dozens of fighter squadrons and seven carrier battlegroups were deployed and prepared for war. The rest, as they say, is history. Operation Desert Storm commenced on January 17, 1991, hours after the UN deadline for Iraqi forces to leave Kuwait had passed. By the end of February, Iraq had been decisively defeated on the battlefield and Kuwait liberated. But Saddam, though weakened, remained in power. It became apparent rather quickly that a long term US military presence in the region was going to be necessary to ensure the stability of the Middle East and the security of US allies there as well. When the fighting ended, US military planners were already examining the lessons learned from Desert Shield and speculating how they could be applied in the future. One lesson towers above the rest in both military importance and significance to US foreign policy in the past twenty five years: A permanent US forward presence is essential for regional stability and security. The US military presence in the Middle East since 1990-91 has served to influence the political and military policies of nations across the world in both positive and negative ways. It has certainly played a key part in everything from the rise of Osama Bin Laden and Al Qaeda to the downfall of Saddam Hussein. For that reason alone, it is worth looking very closely at how the US military presence in the Middle East evolved after Desert Storm. Desert Shield was launched from a standing start. The fact of the matter is that when Iraq invaded Kuwait, the United States was caught with its pants down. There were no permanent bases in the region. Fortunately, there was an infrastructure in place to accommodate a US buildup if it were ever necessary. Saudi airbases had been designed and built to accept a large number of US combat aircraft in the event of a crisis. However, the amount of US military power in the Persian Gulf region on 2 August, 1990 was minimal. The US military footprint in the area had historically been very small to that point. Had Iraq decided to double down on its Kuwait gains, the lack of US forces in the area could have been disastrous for the Saudis, and ultimately for the West. After Desert Storm, for the rest of the 90s the US maintained a large forward presence in and around the Persian Gulf area. 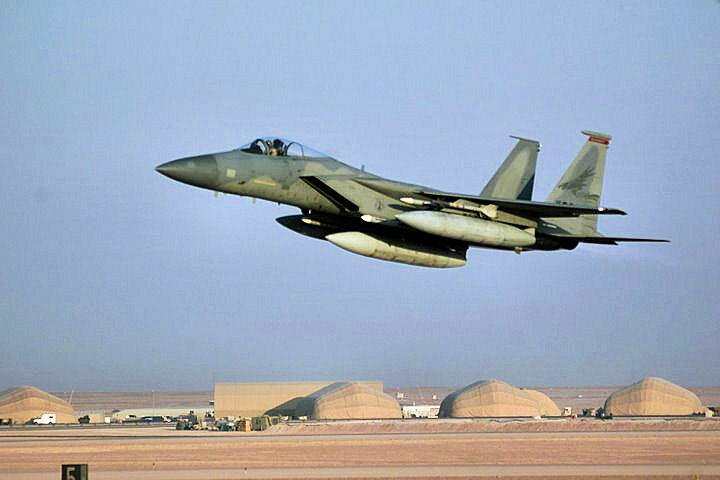 From Prince Sultan Air base in Saudi Arabia, US warplanes flew patrols in support of Operation Southern Watch. Airbase facilities in Kuwait were upgraded and opened for American use and the NATO airbase at Incirlik, Turkey was optimized for aircraft flying Operation Northern Watch patrols. A carrier battlegroup was almost always in the vicinity. Prepositioned material for two US Army heavy brigades arrived in the region. One set was placed in Saudi Arabia, the other in Kuwait. The increased US presence in the region was welcomed by its regional allies. The number of troops was far less than it had been in 1990 and 1991, but still large enough to help ensure the security of the Gulf States. However, from Saudi Arabia to Yemen, the seeds of hate were already being sewn beneath the surface. Having American forces in their nations forced regional leaders to walk a fine line to placate the more extremist elements of their societies. The fact that US forces continued to use Saudi Arabia for operations enraged many Muslims. One of those people was Osama Bin Laden, a wealthy Saud who was enraged by the US decision to remain in the Middle East. He used this as a flag to rally the increasing numbers of followers of his extremist beliefs. America’s military presence in the Middle East indirectly contributed to the 1998 US embassy bombings in East Africa and later the September 11th 2001 attacks in New York and Washington DC. Part 2 of this piece will be published on Monday. In it, we will take a look at how the increased US military presence in the Persian Gulf was essential for reprisal strikes against Iraq in the 1990s as well as Operations Enduring Freedom and Iraqi Freedom in the early years of the 21st Century.